Rita Letendre was first introduced to Paul-Émile Borduas and the Automatists while still a student at l’École des beaux-arts in Montreal. Although advised by her professors that the Automatists were troublemakers and abstraction was inconsequential, Letendre was intrigued by their philosophies and began bringing canvases to Borduas to be critiqued. Disillusioned with the traditional methods of teaching, she soon dropped out of art school and began painting and exhibiting with the Automatists. 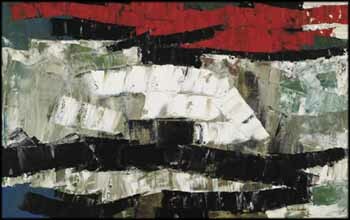 By 1959, she was fully dedicated to abstraction and was producing dynamic and self-assured canvases. With a fervent handling of the painting knife and a simple palette, Letendre has created in Quidam a lyrical composition that is both tactile and expressive. Letendre’s forms struggle between the foreground and the background; tensions are built amid space and movement. It was compositions such as Quidam that earned an invitation for Letendre to exhibit in the 1959 Canadian Biennial. Held at the National Gallery of Canada, this exhibition solidified Letendre’s reputation as an artist who was current and innovative.